I’m going to confess something, I don’t really like the taste of royal icing. I have tried about 10 different royal icing and glaze icing recipes. Glaze icing tastes the best, in my opinion. My problem with glaze icing is that I could never do the fine decorating work that I have seen others do with it. To be truthful, now that I am using royal icing I still can’t do the fine decorating work that is prevalent in many of the wonderful cookie blogs I have read, but that is user error and no fault of the medium! I come closer with royal icing than I ever did with glaze. The one advantage to not liking the taste of royal icing, is that the finished cookies are safe from my sneaky self. My Weight Watcher leader would say “anything that works,” and she is right! 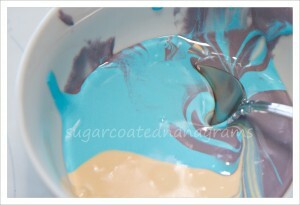 Once I found Julia Usher’s YouTube video on Royal Icing, my whole decorating experience began to change. She is a natural teacher with a no nonsense style. Her technique for making royal icing is different than many recipes I have read and tried. It is with Julia’s permission that I am giving you the link to her royal icing recipe. I could copy/paste her recipe here but I really think you would all benefit from reading her words and watching her videos. Speaking of getting permission from Julia Usher to link her recipe and video, you could have knocked me over with a feather when I received a response from her within hours of my email to her. She was just as sweet as I imagined she would be and I was very appreciative. Consistency is key with decorating cookies. I will admit that I don’t always get it right. It’s really frustrating but, I just remind myself that it’s just a cookie. It doesn’t matter how it looks, as long as it tastes great! 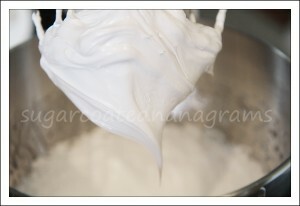 There are many great tutorials on icing consistency but Lila Loa has a great visual on her blog. Visit her link here to see what she has to say about various icing consistencies. Over time my icing recipe has evolved into something that is different than most cookiers use. The reason I like it is because it gets hard enough to package and stack but you aren’t in danger of breaking a tooth when biting into the cookie. 1-4 tablespoons water or enough to get the consistency you want. Flavoring of your choice (vanilla, almond, peppermint, butter, lemon etc.) to taste. Mix confectioner’s sugar and cream of tarter in your mixer bowl. With mixer on low speed, add the egg whites, glycerin, water and the corn syrup. When it has all come together as a big lump in the bottom of your bowl, turn the speed up to high and beat for about 2 minutes. If it’s too thick, add a tablespoon of water. You will notice your icing will get whiter and glossy. That’s when it’s done. I always add white food coloring to my base icing at this point. Mix until combined. I have noticed that I no longer have discoloration on my cookies since I started doing that. Your icing will be very stiff at this point. Add 1 tablespoon of water or more to achieve the thickness you are looking for. I like to keep mine pretty thick. I divide it into the number of bowls I need for the various colors at this point or put it all in once container and put it in the freezer until I need it. It will keep for a long time (days/weeks) on your counter but I don’t like the clutter. Color your icing before you thin it to the consistency you need. If you thin it too much, add more powdered sugar until you get what you are looking for. Another thing I do different is that I freeze my leftover icing. I do not make cookies in the quantities that professional cookiers do, and being on a fixed income means that I have to be frugal where I can. Julia’s recipe makes a lot of frosting. I prefer to make the whole recipe rather than cut it down. This way I always have frosting ready if I want to decorate and ship a few cookies at the last minute. I like freezing in containers because I can defrost it and use it from the container. I can add more powdered sugar if I need it stiffer or add more water if I need a thinner icing, very easily. 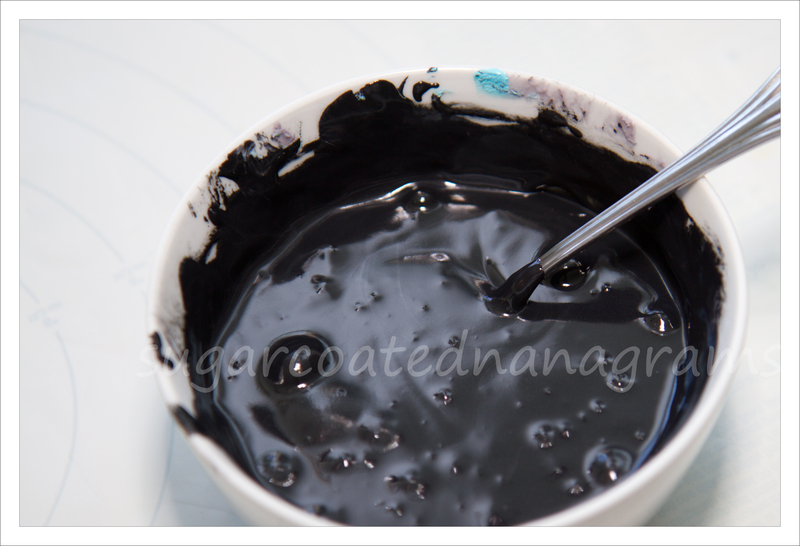 When I am making cookies that use several colors of icing, I put the little bits of the leftover colored icing in a bowl, color it black and freeze it. It’s another way to save. I hope this information has been helpful. If you have any questions, just ask away. I will do my best to answer them.